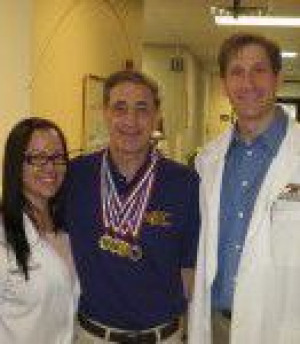 Look for Resurgens Orthopaedics patient Don Albino of Johns Creek among the ranks of Senior Olympians in June as athletes over age 50 go for the gold in Houston. Albino, 68, a patient of Dr. Angelo DiFelice, Jr., at the Resurgens Roswell/Alpharetta location, will compete in track and field events in the 65-69-year-old age group. He attributes his ability to compete to the care he received at Resurgens. Albino first received treatment from Dr. DiFelice for a knee injury in 2007 and was able to compete in the Georgia Senior Olympics in 2008, where he won four medals. However, a foot injury weeks before the 2009 nationals knocked him out of the competition. By 2010, his foot had healed, and he began training for the September Georgia Senior Olympics. However, in July his other knee began to hurt and he returned to Resurgens. Thanks to treatment from Dr. DiFelice that included cortisone shots and physical therapy, along with assistance in a training program, Albino got back to the track in time for the state games. “I did all the things Dr. DiFelice said to do and neither knee gave me any problem,” he said. Albino qualified for this year’s competition by winning four medals in the Georgia Senior Olympic games last September. He won gold in the 100 meters, 400 meters, and the long jump, and silver in the 200 meters. The Senior Olympics are sponsored by the National Senior Games Association, a non-profit member of the United States Olympic Committee dedicated to motivating senior men and women to lead a healthy lifestyle through the senior games movement. The Summer National Senior Games produces the largest multi-sport event in the world for seniors. The 2011 Summer National Senior Games will be held June 16-30 in Houston, Texas. He is a retired regional sales manager for Boston Scientific, a medical devices company. He and his wife have lived in North Fulton since 1977. Dr. DiFelice sees patients in the Resurgens Roswell/Alpharetta office. His areas of expertise include arthroscopic knee and shoulder reconstruction, sports medicine, and knee and shoulder surgery. He received his medical degree from the University of Tennessee at Memphis and completed his residency at the Emory University Affiliated Hospitals in Atlanta. Resurgens Orthopaedics, Georgia’s largest orthopaedic practice, has 20 offices and six surgery centers throughout metro Atlanta. With 98 physicians, Resurgens provides specialized expertise and broad experience in the areas of sports medicine, joint replacement, neck and back surgery, foot and ankle surgery, shoulder and elbow surgery, non-operative spine care, hand surgery, arthroscopic surgery, epidural steroid injection, general orthopaedics, and trauma care. Resurgens provides comprehensive musculoskeletal care in a single location, from injury diagnosis and treatment to rehabilitation services. Learn more at www.resurgens.com. Restore your health. Energize your life. Get back in motion. Resurgenize!